SOAP, the people behind what was initially a sketchy Kickstarter that turned into something reasonable is having another go at crowdfunding their touchscreen router with every radio imaginable. This time, however, they’ve crossed all their ts and dotted all their lowercase js to turn what was a very…. odd Kickstarter into something really cool. The original specs of the SOAP router were impressive – basically, a touchscreen tablet with an ARM Cortex A9, USB 3.0, 802.11ac, gigabit LAN, and every radio module you could imagine. The goal, of course, being a completely open, hackable home automation system capable of talking to Zigbee and Z Wave, and X10 modules, all while being an easy to configure 802.11ac router with a touchscreen. It’s a great idea, and considering you could spend $200 on an ac router alone, without all the radio modules and touchscreen. Judging from the updates to the original Kickstarter, the SOAP guys have come a long way in three months. They’ve moved away from a custom-designed iMX6 board to a Congatec System on Module in a move that could be described as the smartest move in the history of Kickstarter-funded consumer electronics. They’ve also fixed the Ethernet bandwidth limitation of the iMX6, although there’s no word on how that works. To be fair, the SOAP Kickstarter should be studied by business students as the exact opposite of how you should run a Kickstarter. When the project first went up, there were inconsistencies that ranged from not having a functional prototype to lifting images from unrelated open source projects. In the past three months, though, it looks like the team has managed to pull something together. Whether or not the SOAP router will see the light of day remains to be seen, but the team is now in a much better position than they were three months ago. 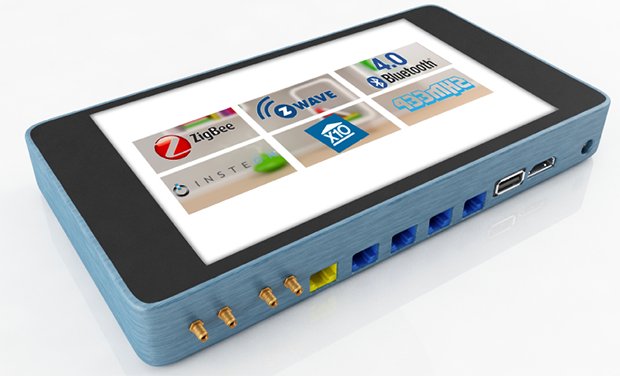 A few days ago, we caught wind of SOAP, a Kickstarter project for an Android-based home automation router. With a quad-core ARM, quad gigabit Ethernet ports, 802.11ac, SATA, and every radio under the sun – all for $100 (sans display, $170 with display), it seemed too good to be true. At the time, it probably was: the images from the PCB prototype were taken from [Bunnie Huang]’s open source laptop, there weren’t enough Ethernet ports for a router, and the hardware just seemed all wrong. The guys behind SOAP have decided to respond to these accusations by posting a huge update on their Kickstarter page and answering a few questions from me. Interview follows below. HaD: There’s a BOM/cost analysis breakdown for the Essentials package (the SOAP sans display) that puts the total cost at about $130. This is the reward for pledging at the $100 level. How accurate is this cost analysis, and how do you plan on meeting that reward level? SOAP: This cost analysis that you mention is very accurate. We will not profit on the early release pricing of $60.00 we have taken the loss leader pricing to attract backers and press (and we think we have done a good job). We are working with a large router manufacturer and this is really the link that makes the pricing possible without them we couldn’t do this. HaD: You’re using a Quad Core Freescale i.MX processor for SOAP, and putting a four port Gigabit router in there. The Quad core i.MX chips only have one Gigabit port, and that’s limited to 470 Mbps. How are you solving this problem, and what are you using as a MAC/PHY? SOAP: First off let me state that we are very aware of the CPU limitations and we have done a lot of work on finding a solution and we do have a unique solution. We have support from a big player in the router industry that has offered us a unique solution that we have been working on to bypass this issue. We will post more on this after our trip to San Jose. This is our fallback method and yes its benchmarks are not as pretty as we want them but they are getting there and we feel with enough tweaks we can get this to decent level. This is from our layout guy: We are planning I.mx processor’s gigabit port will be connected to external IC working as a switch. 1Gb ethernet -> 1 to 4 switch -> 4x Gb Ethernet ports. Possible http://www.ti.com/lit/ds/symlink/tnetx4090.pdf. Use 4 ports from there plus put RGMII Ethernet transceiver from Marvell for each ETH port and we will have on board Ethernet switch. HaD: What WiFi chipset/chipsets are you using? Will that/they be able to do 802.11ac at full speed, and how are you doing this with (I think) only one antenna on the updated board images? SOAP: The speeds have varied greatly on the chipset and how buggy the software was for the day but we have clocked speeds over 1 gigabyte per second and we will continue to develop this further to achieve maximize speeds this is where our new Union with the guys over at Droidifi will help. In our prototype we tested Avastar 88W8864, Broadcom 4360 , and a couple more that failed to actually work. We didn’t get those all functioning like we would have wanted as there is little support for android and router chipsets to date. We demo with a Broadcom chipset. We want to use Quantenna QAC2300 but at current funding we will be using the Broadcom we have received a lot of suggestions from our backers and a new big player behind us that thinks they have the right match we are waiting to announce this after our meeting in San Jose. We have one antenna on the most current design but we are planning on adding two more for the final design. We didn’t place them on the most recent design because we are waiting to see how much funding we get to finalize the wifi chipset. We didn’t want antenna design that worked best with a Broadcom when we switch to Marvel or Quantenna. HaD: What is the status of the software? Do you have a repo somewhere that people could look over? SOAP: We have been working with a new player from the older kickstarter project called Droidifi. We will be working with them on the software. This is a something we haven’t been able to announce till we lock it down but you are the first to know about this union. Check out our update later today. HaD: Finally, do you have a functional prototype with the quad-core i.MX, four Ethernet ports, and WiFi? Can we see a video? SOAP: If you mean a mass production ready device that can be used by an end user then no. We have a solid functioning proof of concept prototype. We have a lot of Demo videos of our POC that show what we have developed so far. We have to have the current PCB design manufactured to get down to the more rigorous testing and qualifying. All the specs listed on our kickstarter are what we currently are planning and we hope to fulfill the tech specs. HaD: There are some other questions in the Kickstarter comments section, but honestly I don’t care about how many Twitter followers you have. SOAP: Twitter was our marketing company. We thought people actually were following us but we have since found out that half of them are not real. Check this out though. All in all we understand how ambitious this project looks and we also know that it technology development can run into roadblocks and things but we want to be clear we are not a scam and we are quite aware where these attacks have originated. We will continue to work hard on this project, we will not be running off to Costa Rica and we plan on seeing everyone at CES next year. Yes, the $100/$170 price is too good to be true. It’s called a loss leader to generate interest. This part was a success. The SOAP guys are partnering with the DroidFi guys for the operating system. The Gigabit Ethernet will probably work, and the WiFi is limited by *nix chipset support. No complete functional prototypes yet. So there you go. It’s not the ideal update with the SOAP crew showing off a shipping container of units ready to be shipped, but the project isn’t in as bad a shape as I originally thought.